THE SKA's THE LIMIT: Curtis Meacham leads the Monkey renaissance. BARACK OBAMA: the ska president? 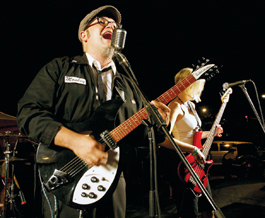 That's what it seems like to Curtis Meacham, guitarist, vocalist and head songwriter for San Jose's longtime ska band Monkey. In the final days of the Bush administration, he explains, the music's popularity was at an all-time low. "We've been through some pretty rough times, where people just expressed their desire to either not be in the band or to not continually beat themselves about the head trying to play music it appeared that no one liked," says Meacham. "I said, 'You're going to feel like that for a while. But keep in mind, if you just stay in the band long enough to see a different president come in, you're going to see a totally different reaction.' And it's absolutely true." Monkey was booked on the Ska is Dead 4 tour, which happened to start the day after Obama's inauguration. "We showed up, and houses were packed and sold out on Mondays," he says. Meacham sees this administration as a time of renaissance for the arts, and for the upbeat, party-in-the-face-of-apocalypse vibe of ska music. "The only way you can control people is to remind them that there's something to fear. Just keep reminding them. The Obama administration comes in he goes, 'Well, this isn't about fear, this is about change. This is about hope.' Everything he does is reminding people, 'Hey, there's a lot of crap out there, and we're dealing with it. But while we're dealing with it, go out and enjoy yourself. Have a beer.'" Suddenly, Monkey finds itself firmly back within the zeitgeist. Their new album Lost at Sea, for which WORKS/San Jose Gallery is hosting an all-ages CD release party Saturday (March 28) is full of many of the same messages that have defined the rise of the Obama era. The title song sets up a backdrop of confusion and uncertainty, but ends with the lines "If we keep on trying, we're going to make this world a better place for man." "It's funny, because I wrote that about two years before Obama came in and really started pushing to be president," says Meacham. "When I heard him, I thought, This is what I wrote about. Humans think alike. When everyone's miserable, there's only one thing that people want, they want change. They don't know how, but they want change. I felt like I finally got the energy right." Things have changed remarkably for Monkey, which when Meacham started it almost 14 years ago was the only traditional ska band in the Bay Area. In that time, they had previously released only three albums. Now, suddenly, they are experiencing a renaissance of their own. Lost at Sea is being released on Mike Park's esteemed Asian Man label, with fantastic production that brings out every hook and horn line, and a perfect-fit package, right down to the artwork by the Aquabats' Parker Jacobs. But when the band was in the studio this time, it ended up recording 26 songs, so a second album on a different label is slated to arrive later this year. And the group is already working on a third album on top of that, meaning that within a year's time it's possible Monkey will have doubled the output it took it over a decade to deliver. Why the creative boom? Trumpeter Brian Lockrem thinks that, somewhat ironically, it's stability and not change that is pushing the band to a new level. "I just think that after many years of searching, Curtis has found more a family than a band," says Lockrem. "This band has been together almost 14 years. I'm the 40th horn player, and there are two more after me. The dude's been searching forever, and finally we've just clicked. I don't think there are any words that could honestly describe what there is in this band, because it doesn't exist in any other band we've come across." That helps not just on the level of general camaraderie, but in the writing process, since Meacham tends to bring in a skeleton of an idea, which the band then fleshes out together. Everyone in the band is on the same wavelength. "When he comes in with an idea for a song, I generally agree with the message and the point that he's trying to get across. So I can pour everything that I have into that song, as can our sax player, as can our trombone player," says Lockrem. He's been in the band five years now; this lineup has been together about four years as a whole. And how could he resist Meacham's pickup line? "I put my résumé up on Craigslist one day," says Lockrem, "and he emailed me and said, 'We play like 250 shows a year, and we don't make any money at all. Want to come play?' And I was like, 'Yes!'" The ska community in Silicon Valley is still pretty small—Firme plays some, but is mostly rock en espanol. Trouble in Paradise is a younger ska band that plays a more third-wave sound. And there are always Sublime clones to be found. But Monkey members take heart that the audaciousness of skankin' may be coming back around. "It's definitely interesting to have been a band as long as we have and to have seen the rise, the fall, the couple of times it crawled out of the gutter and got slammed back in the gutter," says Meacham. "It's almost like it actually died, but people didn't check it to make sure it didn't have a baby, so there's an offspring coming up right now."